Its time for Tina’s Crazy Cooking Challenge again and this time we are searching for the Ultimate Mashed Potatoes recipe. 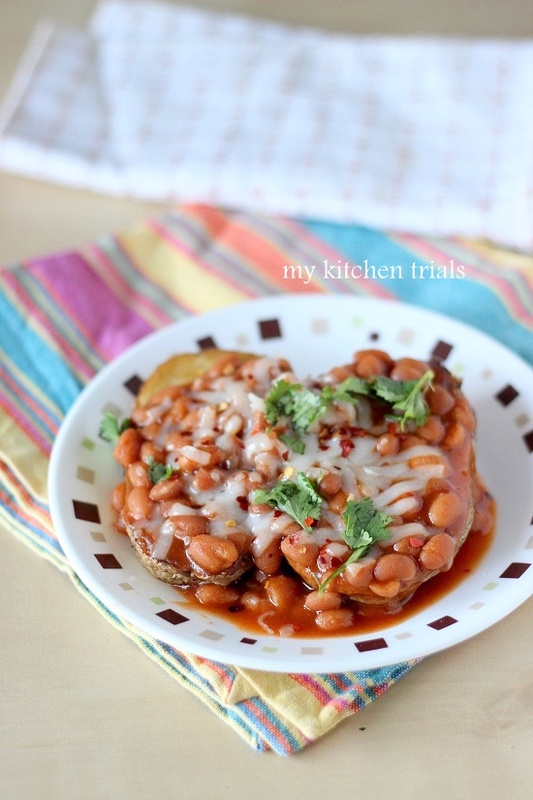 Potatoes are cooked in an Indian household in every possible manner. We have them as side dishes for rice, in curries for rotis, as stuffing for rotis and sandwiches, for snacks as cutlets or deep fried beauties like bondas …the list for dishes using potatoes is literally endless! In short, we are fine with potatoes as long as they are in the ‘main supporting role’ for the dinner. But they are not really liked as main dish. So if I am serving Baked Potatoes at home, I better keep the restaurant’s take out number handy. Chances are I am going need it! So when the challenge recipe was Mashed Potatoes, I knew I would have to serve it the Indian way. I was thinking of a hundred recipes where mashed potatoes are used, but finally settled on Pav Bhaji. The main tool for preparation of this dish is the potato masher. 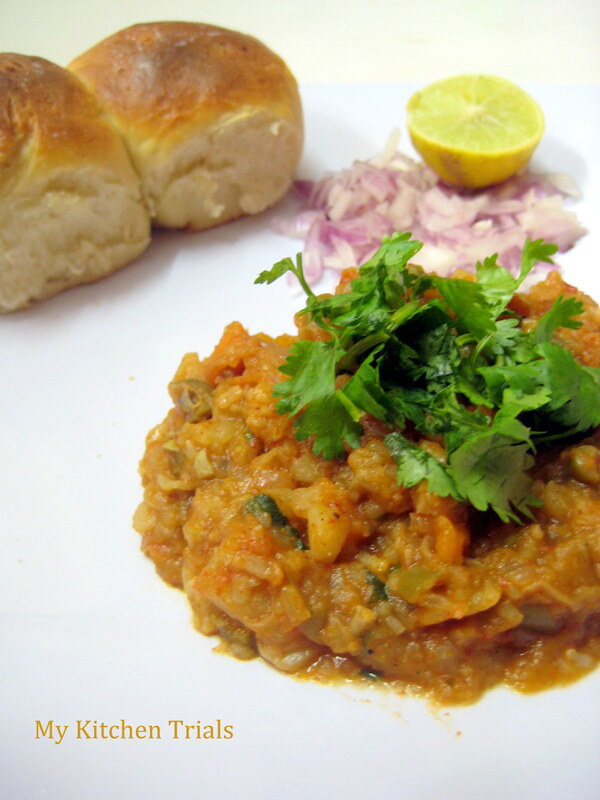 Pav Bhaji is the ultimate street food, where the bread (Pav) is served with spicy mashed potatoes (Bhaji). It is so popular that it is now featured in almost all the restaurant menus. Pav Bhaji is so filling that it can be had as a meal as well. With the Pav bread so easily available in supermarkets now a days, making this dish at home is also common now a days. Traditionally the main ingredients are tomatoes and potatoes, with bell peppers or cauliflower thrown in at times. But when making this at home its common to add a lot of vegetables, since its a good way to sneak in vegetables. 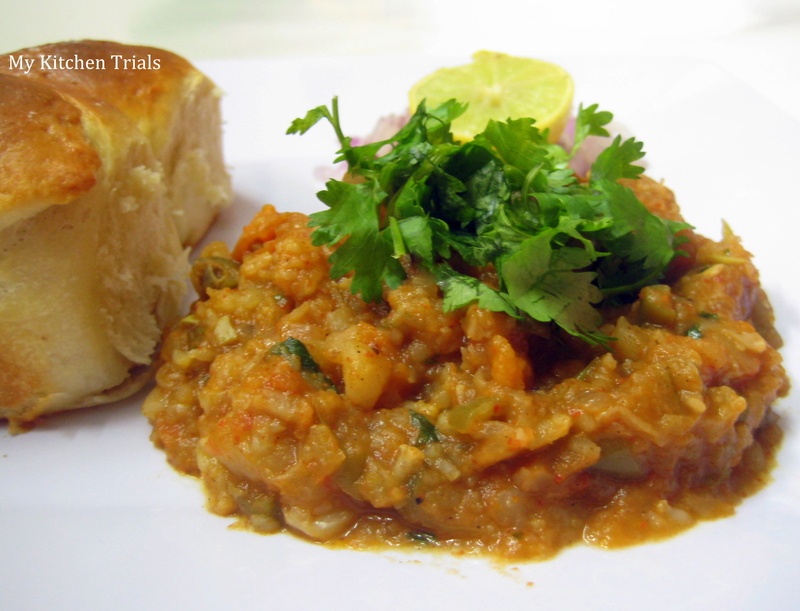 I am a big fan of Aparna’s blog and I have chosen the recipe for Pav Bhaji from her space. You can read a lot more about this dish at her blog. 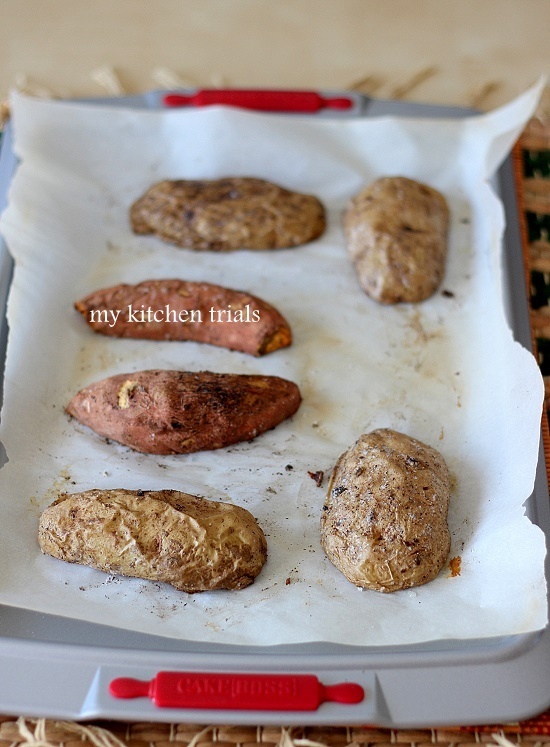 Cook the potatoes, mash them roughly and keep aside. We will be mashing them a lot more when we are cooking. Cook the vegetables (I used carrots, cauliflower and beans), mash them and keep aside. In case you are skipping the vegetables, you can cut the rest of the ingredients by half. Heat oil in a wide pan. Add the onions and cook until they start to brown. Add the ginger garlic paste and cook for a minute more. Add the chopped tomatoes and cook until they are soft. Add the pav bhaji masala, chilli powder and salt. 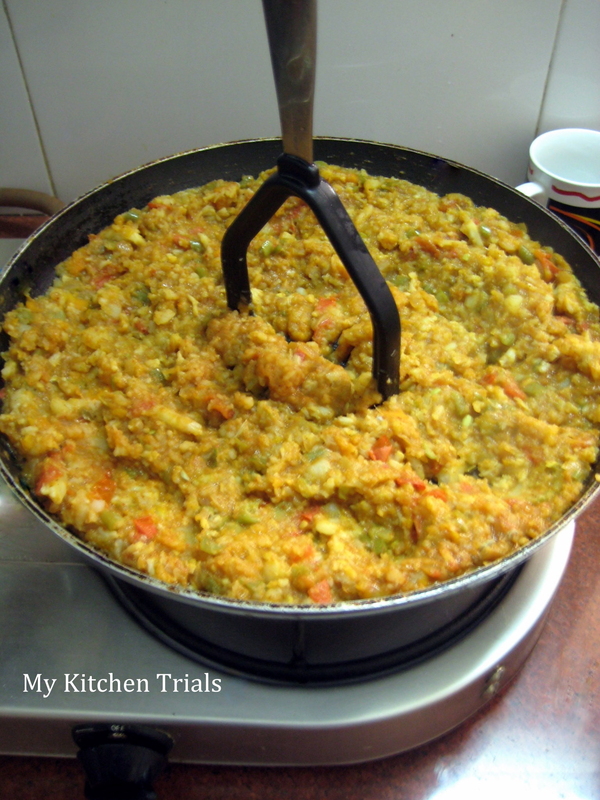 Cook for a 2-3 minutes and then with a potato masher, mash the onion-tomato mixture till they are totally pulpy. Add the mashed potatoes and vegetables. Mash thoroughly till the gravy becomes thick. You can add water in 1/4 cupfuls, if the gravy appears to be dry before the veggies are mashed. You can keep mashing until the bhaji is totally smooth or you can stop when the veggies have been mashed to your level of preference. 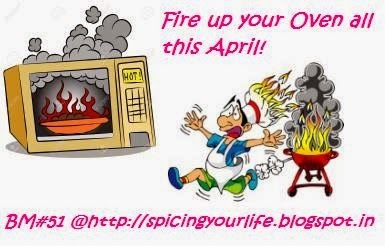 Do a taste test and adjust seasonings accordingly. Add the chopped coriander leaves, 1-2 tbsp of butter and mix. Bhaji is ready to be served. 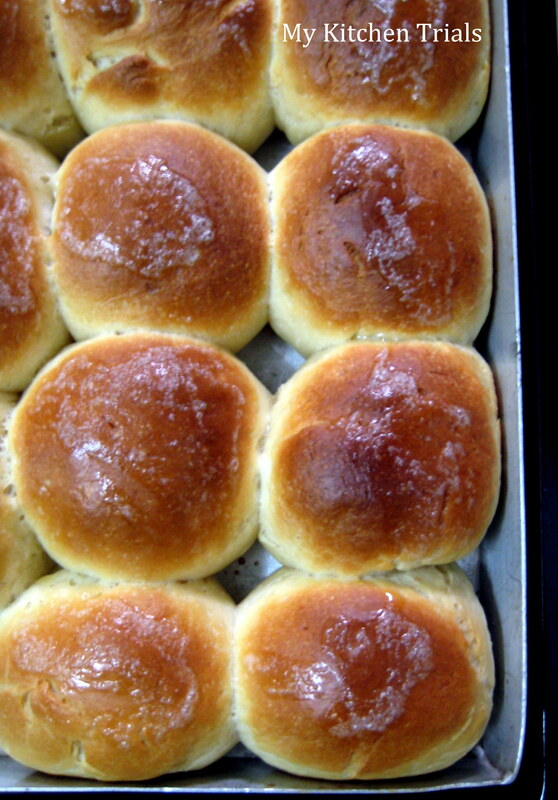 Aparna has adapted a recipe for soft white dinner rolls for the Pav here. Combine the flour, yeast, sugar and salt in a big bowl. Whisk. In a small pan, heat the milk and the butter (1.5 tbsp) together, whisking now and then, till the milk is lukewarm. Mix the lukewarm milk- butter to the flour and knead till you get a soft elastic bread dough. Form a ball, cover and leave the dough in a greased bowl to rise till doubled in size. About 1 -2 hours. When it becomes double, punch the air out, knead for a minute and divide the dough into 15 equal portions (I got 14). Shape them into balls and place them in a greased rectangular baking pan, leaving about 1/4″ between them. I got 4 rows each of 3 balls and one final row with two dough balls. Cover and let it rise for another 30 min. 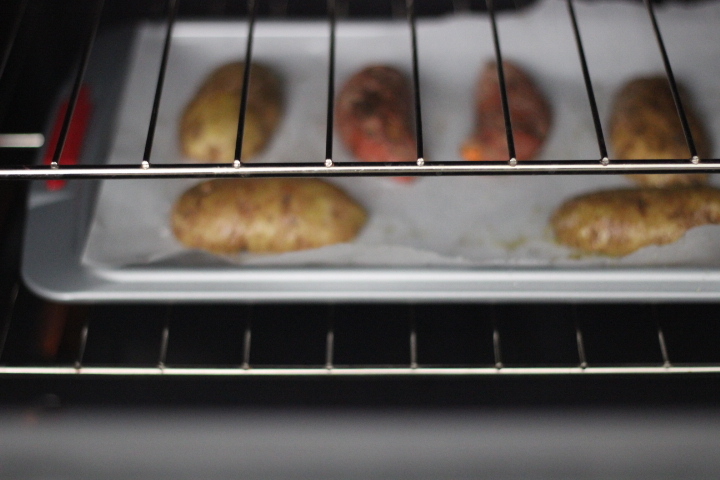 Bake in a preheated oven at 225 C for 10 minutes till they start browning. You need to take them out, brush them with melted butter and then put it back for another 5 minutes. Take the rolls out and cool them in a rack. I brushed some butter on the rolls as soon as they came out of the oven. You can see the butter bubbles on top! In a pan, heat a tsp of butter. Cut two pieces of Pav (the bread roll) across and then place them the cut side down in the heated butter. 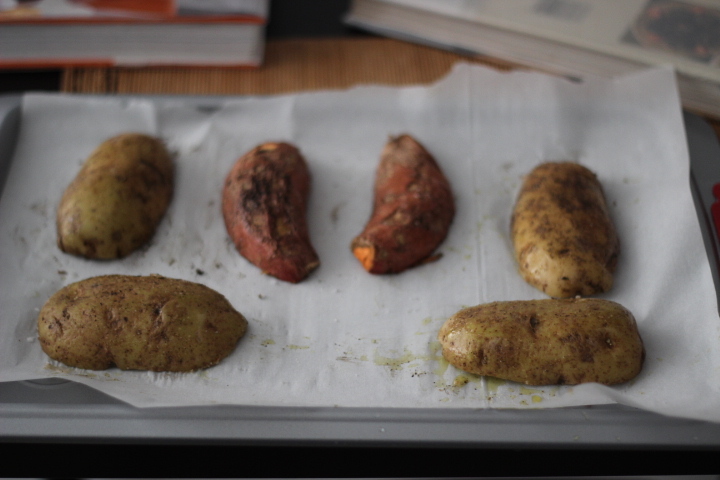 When they becomes slightly brown, take them out and place them in a plate. Add some bhaji (the spicy mashed potatoes gravy) and some chopped raw onions side by side. Cut a lemon in half or quarter and place it next to the onions. You can add some chopped coriander leaves and a dollop of butter if you want to, on top of the bhaji. Squeeze the lemon and add it to the raw onions and bhaji while eating, it tastes delicious. Enjoy! Ideally you have to keep mashing until the bhaji becomes a thick smooth gravy and you cannot differentiate the vegetables in it. But since we like it a bit crunchy, I stop mashing before the veggies become too smooth. I rushed through the dough raising time, so it didn’t raise as much as it should have. I was under the attack of too many hungry people! 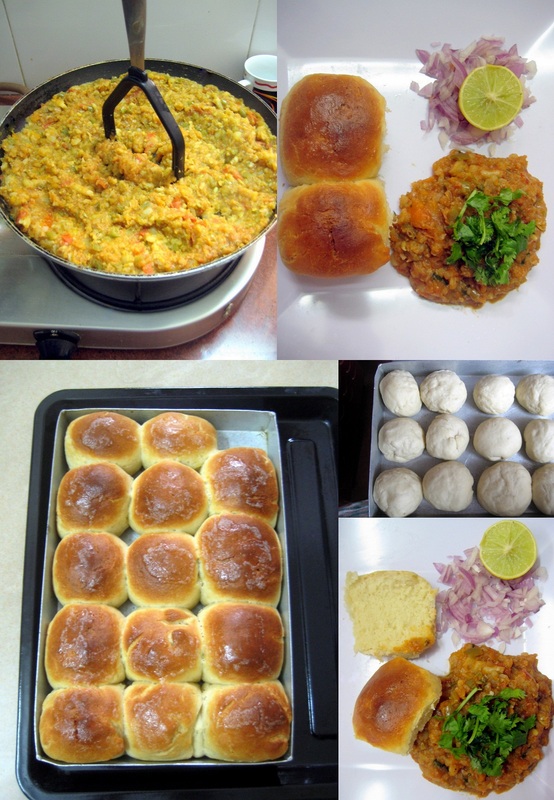 You can watch a video of the authentic Pav Bhaji making here (Courtesy Aparna’s Blog). You can check out here to see the fellow bloggers take on Mashed Potatoes. Linked to Bake Fest also.